The rain had stopped during the night and we woke to a brilliant, crisp, blue skied day. Perfect, for our drive to Pallisa. Yasin, our driver and old friend, showed up right on time and off we went. I love that drive because it takes us out of cities and into the beautiful Ugandan countryside. We pass tea fields, sugarcane, and papyrus. We saw cassava drying by the side of the road and huge bags of charcoal waiting to be sold. My favorite little round houses are everywhere with their grass roofs looking like grass skirted girls twirling under groves of mango trees. Yasin stopped at a “rest stop” where he bought us piping hot roasted bananas of a variety that I’ve never had. They aren’t plantains and yet are just the right amount of sweet and savory all together. Yum! Later he shared pancakes made from cassava flour and sugar and the size of a cookie. Another tasty treat! Jane from Woman of Purpose met us at her home and together we drove to the sewing guild. A program had been prepared for us that included singing, dancing and, my favorite, a skit about The MoonCatcher Project, performed by a dozen students [male and female]. The storyline was about a young girl being teased for having a stained skirt and leaving school because she felt so bad. The teacher talks to the class about the harm in acting this way and some students go to get the girl and bring her back to class. In the end, all the girls in the “class” get a MoonCatcher kit. What fun for us to watch this. Phoebe and I spent a good part of the afternoon working on sewing machines. Boy, did I miss Meredith, our machine whisperer, but in the end, we figured out how to thread an old Juki and fix the belt on another brand. We laughed a lot and talked about hanging out our shingle saying Phoebe and Ellie – sewing machine repair! 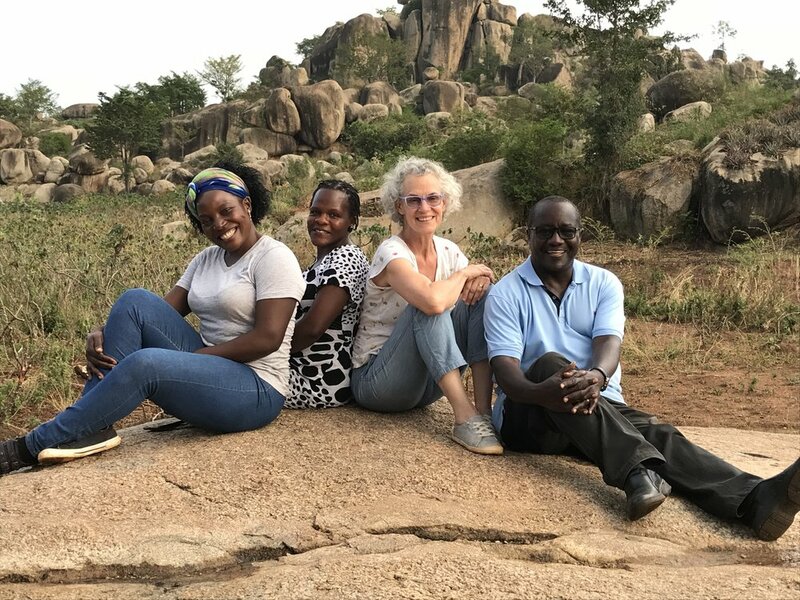 We ended the day with a short ride down the road to Lake Kyoga where we had an impromptu boat ride and got to climb some incredible rock formations too. We fell into bed at Jane’s lovely guesthouse. It was a wonderful and productive day.